Philippians in 28 Weeks is a memorization tool to completely memorize the book of Philippians in 28 weeks. If done as a family read aloud, this can be used with ages 9-11. 12 and up can handle a little bit more with some parental guidance. The program can easily be done alone by the high school years, 14 and up. Perfect for adults as well. I received the E version of KJV for review. I then had it printed out. I highly recommend if you are just going to have it printed, that you buy the print version. The e-version plus the price of having it printed in a store, cost more than just buying the printed version. The process to this memorization series includes reading the complete book of Philippians daily. This will take about 20 minutes. Then you do some writing, either copying the verse for the day, answering questions about the verse, or writing what the verse has spoken to you. Thirdly you repeat the previous verses by looking through and reviewing the verse memory cards for the week, eventually doing them by memory rather than looking at the cards. The final goal to be able to retain the verses you have learned. Through repetition and small bits daily, you will start to memorize more and more of the scripture. I think this system can be applied to any of the scriptures that you want to memorize. I had grand ideas that our whole family could work together and memorize Philippians. One by one they started fading away, hard to keep a large family on track together. The oldest is too busy with college, the youngest loses interest, the middles are getting 'bored'. This takes serious dedication to accomplish, and I felt like I was the only one dedicated to it.. the one with the worst memory of them all! This is a very specialized tool, that is awesome and a wonderful gift for those who can commit themselves to doing it. It is however a very large undertaking as well. I am not giving up, but I am not moving forward as quickly as I would like. A reminder from Stacy in her instructions pops in my mind. The truth that in many countries the Bible is illegal or banned, yet we are free to read any version we want. Like Stacy, my shelves are lined with Bibles in different versions, but left on the shelf they are worthless to my growth. One day we will stand before God and give an account for how we used our time and resources. The resources are available to us through companies like Home School Adventure Co. The time management is something we need to wrestle with ourselves. 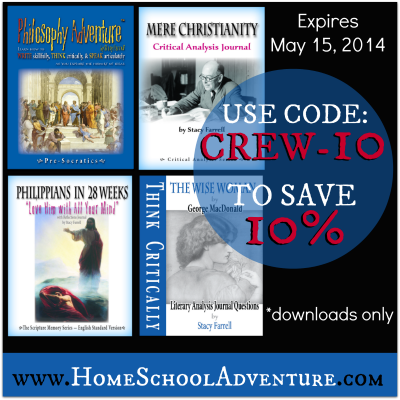 Try Philippians in 28 weeks now with this code for 10% off any download purchase. Check out the other products while you are there. 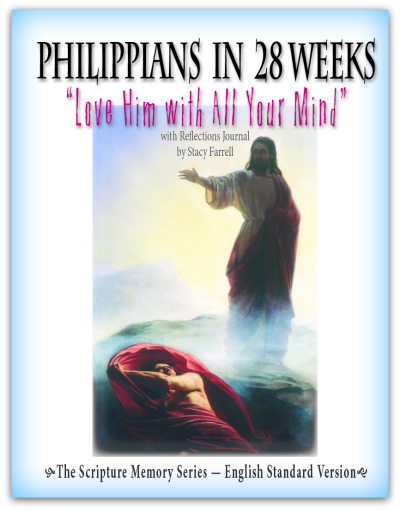 See what other crew members thought of Philippians in 28 weeks and the other products by clicking on the banner below!